While exploring Nova Scotia's Cape Breton Island, my husband and I found the picturesque village of Baddeck. It's so lovely that telephone inventor Alexander Graham Bell chose it for his summer home and burial site. His estate, Beinn Bhreagh (Gaelic for “beautiful mountain”), remains privately owned by his descendants. 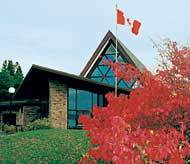 But the nearby Alexander Graham Bell National Historic Site boasts the world's largest collection of Bell artifacts and inventions. We saw furniture from his study and replicas of early telephones. Baddeck is on Trans Canada Highway 105 (Exit 9), near the center of Cape Breton Island and about 50 miles west of Sydney. The historic site ( 559 Chebucto St.) is open 9 a.m. to 5 p.m. daily from mid-October through May; it closes an hour later from June through mid-October and opens at 8:30 a.m. from July through mid-October. For more information, call 1-902-295-2069.